Category: Books, Yoga and Meditation Tags: hand gestures, meditation, Mudras, pranayama, revitalisation, Swami Saradananda, yoga. This new, definitive, fully illustrated guide to the ancient art of mudras provides a highly practical and inspirational overview of how to use subtle yogic hand gestures to revitalize every aspect of your life . In this beautifully presented guide to the ancient art of mudras – an often overlooked Eastern practice that involves making established hand gestures to direct subtle energy to boost health and wellbeing – readers will discover how to integrate more than 60 mudras into their daily life and/or yoga and meditation practice for increased vitality and inner peace. After introductory chapters laying the foundation of mudras, the six central chapters show why and how to do the mudras themselves. Each chapter is dedicated to a different part of the hand and its corresponding element – fire (thumb), air (index finger), ether (middle finger), earth (ring finger), water (little finger) and mind (palm) – focusing on each element’s holistic benefits, whether boosting inner strength, relieving stress, enhancing creativity or increasing concentration. In addition, each mudra entry is enhanced with an accompanying chant, meditation, pranayama, asana, visualization, or personal report about the mudra’s benefits. The book then ends with a series of highly useful mudra routines for a range of health issues, both physical and emotional – from anxiety and chronic fatigue to arthritis and headaches. 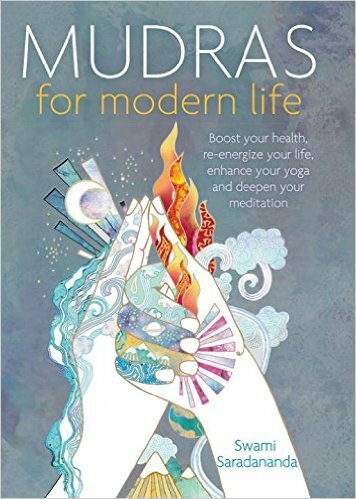 There’s genuinely something for everyone in this beautiful new book on the health-enhancing art of mudras. Swami Saradananda is an internationally renowned yoga and meditation teacher who inspires you to want to practice, and the author of a number of books, including Chakra Meditation, The Power of Breath and The Essential Guide to Chakras. Having worked for almost 30 years with the International Sivananda Yoga Vedanta Centres as a senior teacher in New York, London and Delhi, she is now based in London, teaches yoga and meditation worldwide, and leads pilgrimages to India.